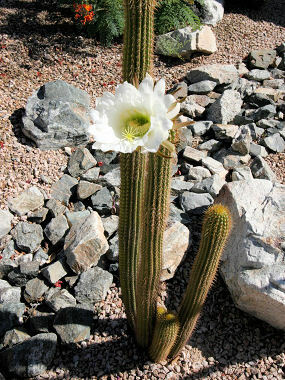 Desert Night-Blooming Cereus is a member of the Cactus Family. It is a cylindrical cactus that can grow straight up or along the ground to 8 feet in height, but is usually shorter. It has dark-colored spines which grow to 1/8 inches in length. The cactus grows in desert flats and washes under trees or shrubs at elevations between 1000 - 3500 feet. The flower of the Desert Night-Blooming Cereus is very fragrant and lasts only one night. 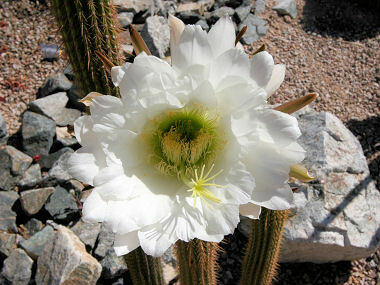 Desert Night-Blooming Cereus blooms in June or July and produces a spectacular large, white flower with numerous yellow stamens which grows to 4.5 inches in width and 8.5 inches in length Flowers are followed by an orange-red, elliptical fruit with short spines to 3 inches in length.